On Sunday, June 24, the Penguin Random House LGBTQ Network participated in the NYC Pride March that was organized to celebrate, advocate for and support the LGBTQ community. 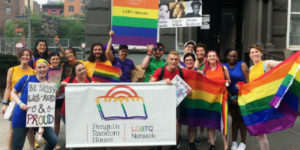 For the sixth year in a row, Penguin Random House employees and their spouses, partners, friends, and family marched to support LGBT rights. Read on for pictures and to hear what marchers had to say about the day! “It was an absolute joy to march with PRH’s LGBTQ Network! There was a tremendous amount of support from both members of the Network and from parade spectators. 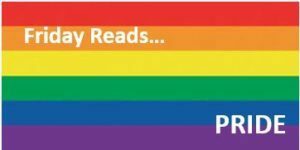 LGBTQ inclusion in the publishing industry was definitely showcased by our participation.” –Matt Romano, DK “This was my first time walking in Pride, and I wasn’t sure what to expect. But seeing so many people celebrating themselves freely and confidently—and celebrating each other—made me feel empowered and proud to be who I am.” –Jennifer Huang, Riverhead “It was such an honor to be able to participate in Pride as a member of PRH's LGBTQ Network. It was not only incredibly heartwarming to witness the strength of New York's thriving and compassionate LGBTQ community by marching alongside the hundreds and thousands of Pride's fellow marchers and attendees, but it also reminded me of how incredibly proud, honored, and thankful I am to be welcomed and accepted as a member of the PRH family.” –Tiff Ferentini, Kodansha Comics “It was exhilarating walking in the parade with the PRH LGBT Network, knowing I was surrounded by the most supportive, wonderful colleagues—and knowing that our company has been equally supportive at every turn.” –Max Felderman, PPG Sales The Penguin Random House LGBTQ Network was conceived to provide: a supportive environment to all employees who share the common idea of nurturing workplace diversity; a forum for professional and social opportunities; a community among the LGBTQ individuals at Penguin Random House; and an increased awareness of LGBTQ authors and books within the community. In June we celebrate Lesbian, Gay, Bisexual and Transgender Pride Month (LGBT Pride Month), which honors the 1969 Stonewall riots in Manhattan. First, President Bill Clinton declared June “Gay & Lesbian Pride Month” on June 2, 2000. In 2009, President Barack Obama declared June Lesbian, Gay, Bisexual, and Transgender Pride Month. LGBT Pride Month events attract millions of participants around the world. The purpose of the commemorative month is to recognize the impact that lesbian, gay, bisexual and transgender individuals have had on history locally, nationally, and internationally.